Tips to Help Sell a Basement Flat. My Nephew is in the process of selling a one bedroom basement flat, which is currently being advertised with a local estate agent here, (it's been on with a previous agent already with no luck) it is a perfectly good little flat, the problem in my mind is that the flat is being shown empty and is totally devoid of any features or personality, so as the interiors obsessed Aunt that I am, I have come up with some tips for styling a basement flat to sell. Basement flats are notorious for having a bad name for themselves, perceived as being dark, damp, with low ceiling height, etc, and yes they are what they are, but with a bit of clever styling and lighting they can be anything but dark and damp. Taking the images above as inspiration this is what I suggest. Walls: I suggest painting all the walls white, (currently the walls are a magnolia colour with darkish wallpaper running along one wall) 46% of buyers are put off by dark and dingy spaces, but you can purchase special light reflecting paints these days that will help capture any available light and bounce it around the room. Consider adding colour by papering an alcove, or leaning a large colourful canvas against a wall. This will instantly brighten up the room and make photographs much more appealing to potential buyers. Flooring: The floor is currently a good quality laminate, but adding a large textured neutral rug will ground the living area, and define it. 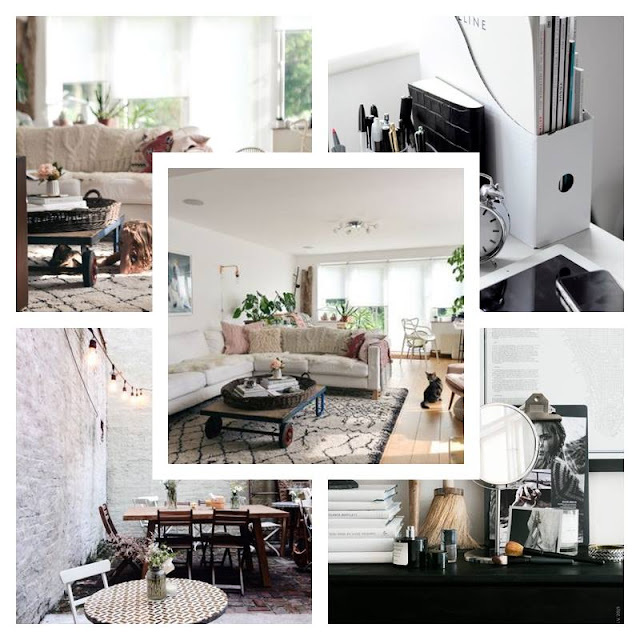 Furnishing the flat: In a basement with low ceiling proportion is key to making it feel spacious, a sofa that has a relatively low back to it will work much better than a large chunky one. Again add warmth and texture with cushion. If like this flat you don't have period features, introduce a few quirky items that add personality, and make the space feel loved and interesting. Buyers typically need to get that all important feeling when entering a home. Furnish the bedroom in a simple neutral scheme, again add quirky touches to a dressing table. Any outside space is a big plus with a town property even if it is just a yard, the flat my Nephew is selling has one very similar to the one you can see in the top photo, but by adding a few lights plants and some tables and chairs, it brings the space to life and suggests a lifestyle. Look out for Free-Cycle items on websites and facebook pages, old drawers can be repainted, a double bed can be covered over with lovely bedding and throws, and as no one is going to sleep in it, it's not too important what it looks like underneath it all. Use plants to add life and movement to a room, even fake ones can make a house feel lived in and loved. Style Space and stuff is a home and lifestyle blog focusing on Interiors, food, decor and DIY, Aimed at being budget friendly, it is all about creating a lifestyle that is kind to your pocket but equally stylish and trendy.